YUKON CHAMPIONS – Skip Pat Paslawski releases a stone during a game against Wade Scoffin yesterday morning at the Whitehorse Curling Club. 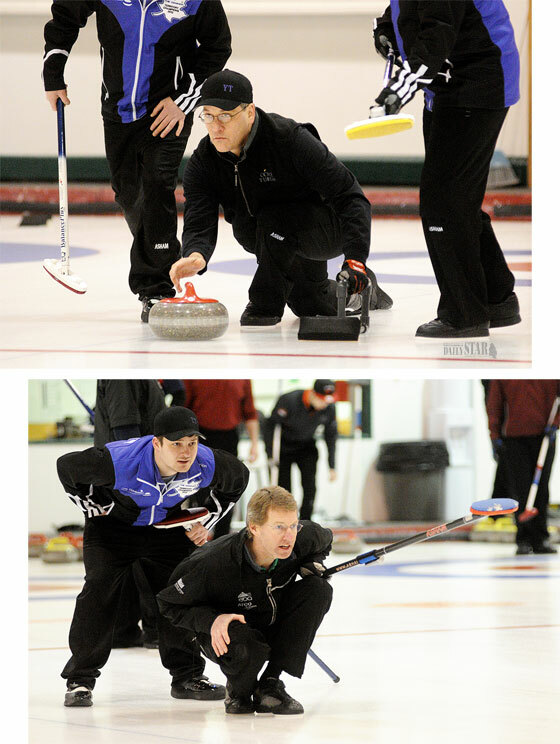 The two teams will represent the Yukon at the YT/NWT playdowns next month (top). AIMING FOR A BRIER RETURN – Wade Scoffin, right, and Alexx Peech watch a stone go down the sheet during the final game of the round robin in the Yukon men's curling playdowns. Team Paslawski and Team Scoffin were both 4-0 entering their final game. Alexx Peech reached back and patted Pat Paslawski on the back after the veteran skip released his final stone in the 10th end. Sitting one but down 5-4 to Wade Scoffin's rink, Paslawski's hammer stone slid unswept into the house for a score of two and the Yukon men's curling championship victory. The 6-5 victory by Paslawski's rink means his team will enter the YT/NWT Brier playdowns in Whitehorse Feb. 6 to 9 as the top Yukon seed. Wade Scoffin's rink will be the second seed. The two teams will battle the top two rinks from the Northwest Territories for the right to represent the North at the 2014 Tim Hortons Brier. While the N.W.T. playdowns have not yet been held, Yellowknife skip Jamie Koe is expected to be the man to beat. Koe has represented the territories at the Brier for the past five years. Paslawski and Scoffin entered the final game of the six-team round-robin tournament Sunday morning sporting 4-0 records after defeating the other teams led by skips Ray Mikkelsen, Bob Smallwood, Walter Wallingham and Gord Zealand. After five ends, the score was deadlocked at 4-4. Scoffin would strike for a single in the sixth to go up 5-4 and that's where the score would stay as Paslawski blanked the next three ends. When Scoffin was slightly wide on a takeout attempt with his final shot of the 10th end, the stage was set for Paslawski's heroics. Paslawski, 47, said there was more to Peech's pat on the back than what met the eye. "I had that shot to win a game earlier in the weekend (versus Smallwood), and I threw it through, because the ice is just so keen,” Paslawski told the Star. "We won it in an extra end – luckily. This time, Paslawski made sure. His shot stuck and handshakes followed. Their victory at the Yukon Men's Curling Championships marks the latest achievement for the Paslawski foursome which was the first rink in Yukon history to earn a playoff berth at the Dominion Club Curling Championships in November. Now, Paslawski and rinkmates Doug Hamilton (third), Peech (second), and Trent Derkatch (lead) have their eyes on the top tournament in the country – the Brier. While knocking off Koe will be a stiff challenge, Paslawski said there's always hope. "In our mind, he's the favourite but I feel really lucky that we do have two really strong teams coming out of Whitehorse this year, so that gives us some advantage,” he explained. Paslawski has curled at the Canadian men's curling championships before, going 0-11 on a rink with Peech's father, Orest, in 1999. He would love to have a second crack at the country's top teams. The 2014 Brier will be hosted in Kamloops, B.C., March 1 to 9. Scoffin was a member of the last Yukon team to attend the tournament in 2008, and the 47-year-old father of junior curling standout Thomas Scoffin believes he has assembled a team that can put the Yukon back on the curling map. Scoffin's rink consists of third Steve Fecteau, second Mitch Young, lead Clint Ireland and coach/alternate Kevin Patterson. Ireland also attended the 2008 Brier, while Patterson fills in at second in the Whitehorse Curling Club's Tuesday night Super League as Young attends university in Calgary. In lieu of regular play, the group got together with Young in Calgary in November to participate in a World Curling Tour event. Scoffin said his team curled well throughout this weekend's territorial championships. Scoffin said attending the Brier is a "privilege.” Oftentimes, curlers make sacrifices with their families in order to make a run at the tournament. Scoffin said it was exciting to see six teams battling in the men's playdowns this weekend, after no teams battled in local Brier or Scotties playdowns last season. Smallwood finished third with a 3-2 record, Zealand finished fourth at 2-3, Wallingham was fifth at 1-4, and Mikkelsen's rink went winless.